Thank you for joining me as we count down to the next MFT release. We are just two short days away from the big day! All the new Stamps, Die-namics, and Stencils will be available on Tuesday, June 2 at 10:00pm EST. Be sure to check out the MFT Blog to see all the new items being revealed today. Don't forget to leave a comment on the MFT Blog countdown posts, YOU could win one of the five $75.00 gift vouchers. 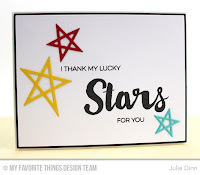 I have two cards to share with you today, they both feature the Count the Stars stamp set and Lucky Stars Die-namics by Laina Lamb. I absolutely LOVE this new line from Laina. For my first card, I created a dreamy sky using After Midnight, Lavender Fields, and Tropical Teal Premium Dye Inks with a few Blending Tools. I started with the Lavender in the center, then the Tropical Teal, and finally the After Midnight. 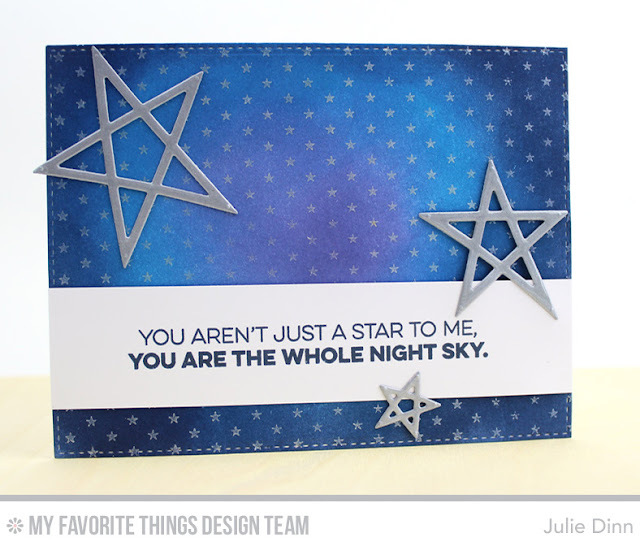 I stamped over the night sky with the new Tiny Stars Background in Silver Delicata ink. The stars were die-cut in Shimmery Silver card stock. I added some adhesive to the back of the card stock before I die-cut them. I added a thin layer of Crystal Effects to the stars to give them that extra little shine. My next card is a clean and simple one. 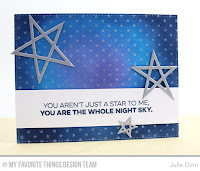 I used a few of the stamps from the Count the Stars stamp set to create the sentiment. They ability to mix and match the sentiments in this set is one of my favourite things about it. You can create just the perfect saying! The stars were die-cut in Lemon Drop, Red Hot, and Blu Raspberry card stock. Be sure to check out the MFT Blog to see all the fabulous creations the design team has to share with you today. Great job on the sponging of the night sky. I love your card Julie. They are great. I need this beautiful background stamp! Love how different both the cards are and yet so pretty! Absolutely love the tiny stars background! Beautiful night time sky and great sentiments to go with it. Beautiful card is awesome and so beautiful! Both cards are great! 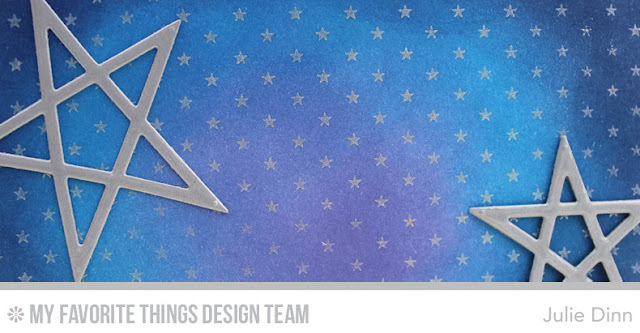 Hypnotizing mottled back ground stars and outstanding primary colored die cut stars. Stars are one of my all time favorite shapes.